The Dunwoody winning streaks at the DCSD Golf Championships continued on Tuesday at Sugar Creek Golf and Tennis Club as a fourth consecutive sweep went in favor of the Wildcats. Dunwoody’s streak atop the boys’ standings under Head Coach Doug Friedlander increased to nine consecutive years including a tie with Arabia Mountain in 2014 that went three playoff holes before darkness ended play. The Wildcats finished with a team total of 313 as Lakeside finished second for the ninth consecutive season with a 344. Chamblee was in third for the second consecutive season with a team score of 383. All six Wildcats finished in the top 10 led by second place finisher senior Davis Brainard (74) and third place finisher and 2016 medalist sophomore Jackson Perry (75). 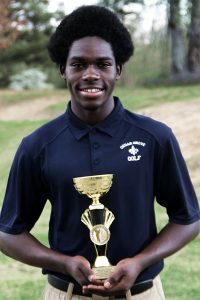 Junior Nick Trembath finished in a tie for fifth place with Arabia Mountain’s Nylan Washington as both finished 18 holes with a score of 81. The fourth score for the Wildcats to complete team scoring was an 83 by junior Ben Warren (8th). Other scores for Dunwoody included junior Patrick Caiaccio (9th, 84) and sophomore Jack Kerdasha (10th, 86). Cedar Grove senior Noah Kuranga ended two years of missing out on the top prize in playoffs to Dunwoody’s Peter Trask (2015) and Jackson Perry (2016) by winning the title outright with a day’s best 73. Other Top 10 finishers include Lakeside senior Zach Garlow (4th, 80) and Lakeside senior Harris Dasher and Arabia Mountain sophomore Torrance Allen in a tie for sixth with rounds of 82. The Lady Wildcats completed the sweep with a tight 186-189 victory over Lakeside to win their fourth consecutive title on the course at Sugar Creek. 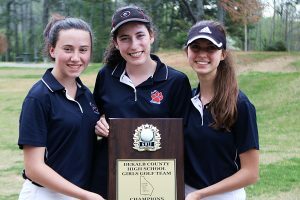 Dunwoody senior Lauren Callahan (84) finished second for the third consecutive year to Cedar Grove’s Mariah Kuranga (81) who completed a four-year sweep of the tournament. Callahan closed the gap on Kuranga each year from 29 strokes in 2014, to 15 a year ago and within three in their final head-to-head meeting in high school. Callahan’s senior teammate Olivia Vergara finished seventh overall with a 102 to aid Dunwoody’s sweep. Kuranga coupled with her older sister Sarah Kuranga’s championships gave the sister duo a six year streak of titles from 2012 to 2017 and seven out of eight with Sarah who played at Columbia High winning in 2010 as well. Her win together with her brother Noah’s victory this year gave the Kuranga family a sweep of the individual titles. Lakeside’s second place finish was paced by sophomores Kaylee Cornelius (3rd, 88) and her twin sister, Jayla, finishing in a tie for sixth at 101 with Arabia Mountain freshman Miracle Goolsby. 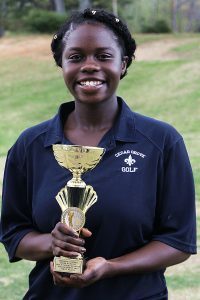 Druid Hills freshman Hailey Crosby was fourth with a 96 and Chamblee sophomore Tiffany Li rounded out the Top 5 by improving 12 strokes form 2016 with a 98. Li teamed with fellow sophomore Kristen Nwadike (104) to lead Chamblee to a third place finish of 202.